To clear the soup, use the whites of the eggs only. To every two pints of stock allow one large egg white. The entire egg may be used, but the white only gives a better flavor and the yolk can be easily used in salad dressing. Wash the shell before breaking, and put it in also. Mix the egg in the cold stock, and beat well together. Place over the fire and stir constantly until it boils, then stop stirring, and let boil until a perfectly clear liquid appears below the scum, then strain through a cloth. If the soup does not boil long enough, it will be cloudy after straining. The fat must be all removed from the top of any soup before serving. 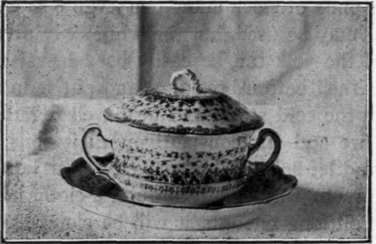 A clear soup is appropriately served without anything in it, or it may have anything which will harmonize with the broth, and not cloud the soup. Clear soup is often called "consomme." A consomme made of beef broth alone may have added to it pearl barley well cooked, drained, and rinsed. One of the numerous pastes, as vermicelli, or macaroni, cut into very short pieces or rings, Italian paste or letters, spaghetti, etc. A good rule is, add nothing which will cloud the soup. This is simply a clear soup to which vegetables cut in fancy shapes are added. The vegetables may be cut in long, slender, match-like pieces. Use well-cooked and rinsed green peas on account of the color, but most vegetables should be either long, or some fancy shape. This stock is made in the same way as directed for clear soup, except to each fowl use about one pound of lean beef, and simply put the breast in on top long enough to cook it, and take it out, letting the beef fill its place in making the stock. Cook with the chicken two small stalks of celery. This is specially nice with rice or noodles, or any of the before-mentioned pastes. There are many varieties of soup made from clear stock, and each takes its name from the material served in it. When served without any additions, they are called "amber soup," "plain consomme," etc. To a chicken broth made as above, but not cleared, add bits of chicken cut in small cubes, season, and just before serving add a teaspoonful of curry powder, or as much as is needed to season it very highly. May leave out the diced chicken, and use rice instead. When flavoring other soups, never use powdered spices, as they form a sediment at the bottom of the plate, and spoil the appearance. Whole cloves and other spices should be stuck into the vegetables while boiling. Whole pepper is superior to ground, but it requires several hours boiling. Make and clear the stock the same as for clear soup, but have the stock stronger and darker than for clear soup, and use lean meat without bone in making the stock. Serve bouillon in cups, and always plain. Bouillon is generally made of best round. When bouillon is to be served cold, this is necessary to prevent its jellying, but when served hot, it is just as well to use bone with the meat, the only necessity being to have it strong, dark, and clear, with a fine flavor.